2016-05-31 AMP member Kuan-Chuan Peng successfully passes his PhD Dissertation Defense. 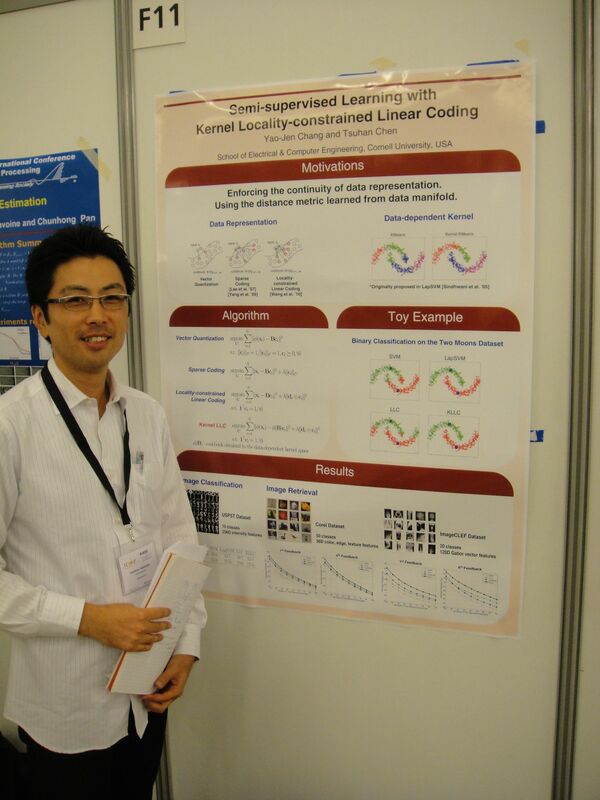 His thesis work is entitled "Towards Solving Abstract Tasks Using Convolutional Neural Networks." His thesis committee members include: Tsuhan Chen, Kavita Bala, and Serge Belongie. Congrats to Kuan-Chuan! The following paper by AMP members has been accepted into the IEEE International Conference on Image Processing (ICIP), 2016. The conference will be held in Phoenix, AZ from September 25th - 28th, 2016. Kuan-Chuan Peng, Amir Sadovnik, Andrew Gallagher, and Tsuhan Chen, "Where Do Emotions Come from? Predicting the Emotion Stimuli Map." The following paper by AMP members has been accepted into the Computer Vision and Pattern Recognition (CVPR), 2016. The conference will be held in Las Vegas, NV from June 26th - July 1st, 2016. Yuuka Kihara, Matvey Soloviev, and Tsuhan Chen, "In the Shadows, Shape Priors Shine: Using Occlusion to Improve Multi-Region Segmentation." 2016-04-08 AMP member Amandianeze Nwana successfully passes his PhD Dissertation Defense. His thesis work is entitled "Tag Personalization via User Preference Orders." His thesis committee members include: Tsuhan Chen, Salman Avestimehr, Jeff Hancock, Lillian Lee. Congrats to Amandianeze! The following paper by AMP members has been accepted into the IEEE Winter Conference on Applications of Computer Vision (WACV), 2016. The conference will be held in Lake Placid, NY, USA from March 7th - 9th, 2016. Kuan-Chuan Peng and Tsuhan Chen, "Toward Correlating and Solving Abstract Tasks Using Convolutional Neural Networks." Cadillac Rear Camera Mirror is named 2015 Popular Science 'Best of What's New' award winner. AMP alumnus Wende Zhang leads the team of this feature development from concept to production in the last few years. Congratulations to Wende! Cadillac Rear Camera Mirror named 2015 Popular Science 'Best of What's New' award winner.. The following paper by AMP members has been accepted into the IEEE International Symposium on Multimedia (ISM), 2015. The conference will be held in Miami, Florida from December 14th - 16th, 2015. Amandianeze Nwana and Tsuhan Chen, "Towards Understanding User Preferences from User Tagging Behavior for Personalization." The following paper by AMP members has been accepted into the IEEE International Conference on Computer Vision (ICCV), 2015. The conference will be held in Santiago, Chile from December 13th - 16th, 2015. Hang Chu, Dong Ki Kim, and Tsuhan Chen, "You Are Here: Mimicking the Human Thinking Process in Reading Floor-Plans." 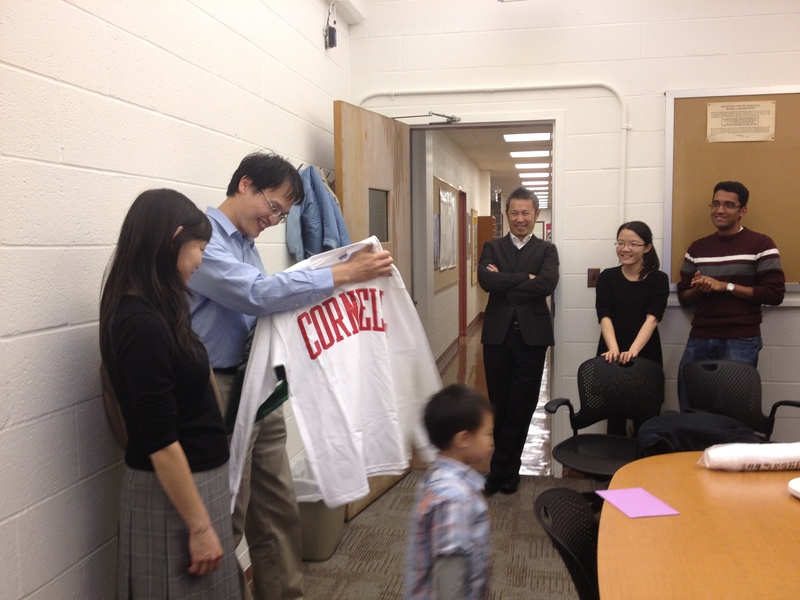 AMP MEng project is awarded on Cornell's ECE Day! Hsaio-Tung Chen, an ECE MEng (masters of engineering) student from AMP Lab, wins the first place under the category "AI & Pattern Recognition" in ECE MEng Poster Session on Cornell's ECE Day. The posters are judged on originallity, presentation, and demonstration. 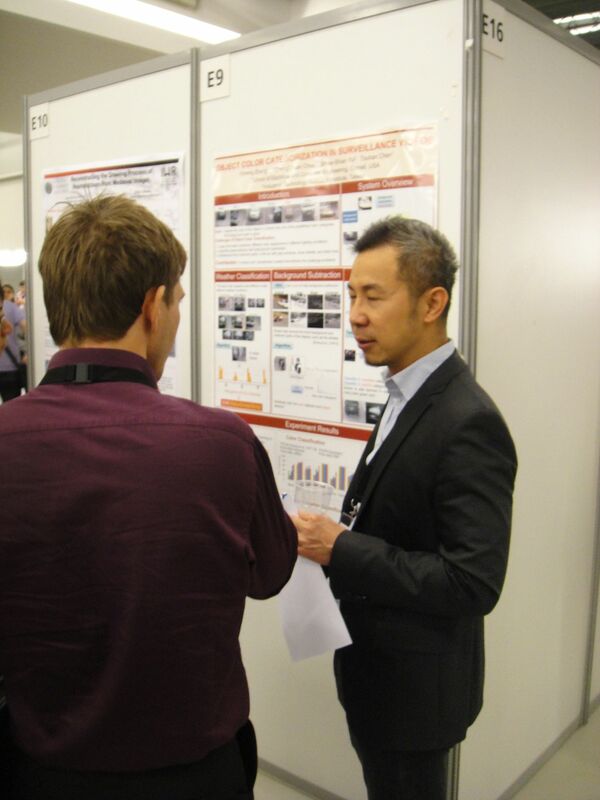 Hsaio-Tung's work (Automatic Image Tagging System) is listed as the top posters. Congratulations to Hsaio-Tung! The following paper by AMP members has been accepted into the IEEE International Conference on Image Processing (ICIP), 2015. The conference will be held in Quebec City, Canada from September 27th - 30th, 2015. Kuan-Chuan Peng, and Tsuhan Chen, "Cross-layer Features in Convolutional Neural Networks for Generic Classification Tasks." AMP member Amandianeze Nwana wins the Bouchet Graduate Honor Society research award in sciences. AMP member Amandianeze Nwana wins the Bouchet Graduate Honor Society research award in sciences, which is awarded annually to the member of the society who gives the most outstanding oral presentation in the Science, Technology, Engineering and Mathematics (STEM) fields division at the annual Bouchet Conference on Diversity and Graduate Education. The Bouchet Graduate Honor Society recognizes outstanding scholarly achievement and promotes diversity and excellence in doctoral education and the professoriate. The Bouchet Society seeks to develop a network of preeminent scholars who exemplify academic and personal excellence, foster environments of support, and serve as examples of scholarship, leadership, character, service, and advocacy for students who have been traditionally underrepresented in the academy. The following paper by AMP members has been accepted into the IEEE International Conference on Multimedia and Expo (ICME), 2015. (oral presentation) The conference will be held in Torino, Italy from June 29th - July 3rd, 2015. Kuan-Chuan Peng and Tsuhan Chen, "A Framework of Extracting Multi-scale Features Using Multiple Convolutional Neural Networks." The following paper by AMP members has been accepted into the Computer Vision and Pattern Recognition (CVPR), 2015. The conference will be held in Boston, MA from June 7th - 12th, 2015. Kuan-Chuan Peng, Amir Sadovnik, Andrew Gallagher, and Tsuhan Chen, "A Mixed Bag of Emotions: Model, Predict, and Transfer Emotion Distributions. "(supplementary material). Satoshi Ueno's paper "A Calibration method using one point for instructing robot by pointing gestures" has been published in the Journal of the Institute of Image Information and Television Engineers. AMP alumnus Ruogu Fang, a professor at Florida International University, has a paper entitled "Robust Low-dose CT Perfusion Deconvolution via Tensor Total-Variation Regularization" accepted by the upcoming issue of the IEEE Transaction on Medical Imaging. Ruogu Fang, Shaoting Zhang, Tsuhan Chen, and Pina C. Sanelli. "Robust Low-dose CT Perfusion Deconvolution via Tensor Total-Variation Regularization." IEEE Transaction on Medical Imaging, 2015. AMP alumnus Devi Parikh receives the Allen Distinguished Investigator Award! AMP alumnus Devi Parikh, a professor at Virginia Tech, has won the Allen Distinguished Investigator Award, which is awarded by the Paul G. Allen Family Foundation. The details can be found here. AMP alumni Zhaoyin Jia's Paper "3D Reasoning from Blocks to Stability" has been accepted to the upcoming issue of the Transactions on Pattern Analysis and Machine Intelligence. 2014-6-24 AMP member Amir Sadovnik successfully passes his PhD Dissertation Defense. His thesis work is entitled "It's Not Polite to Point: Refering Expressions for Visual Scenes". 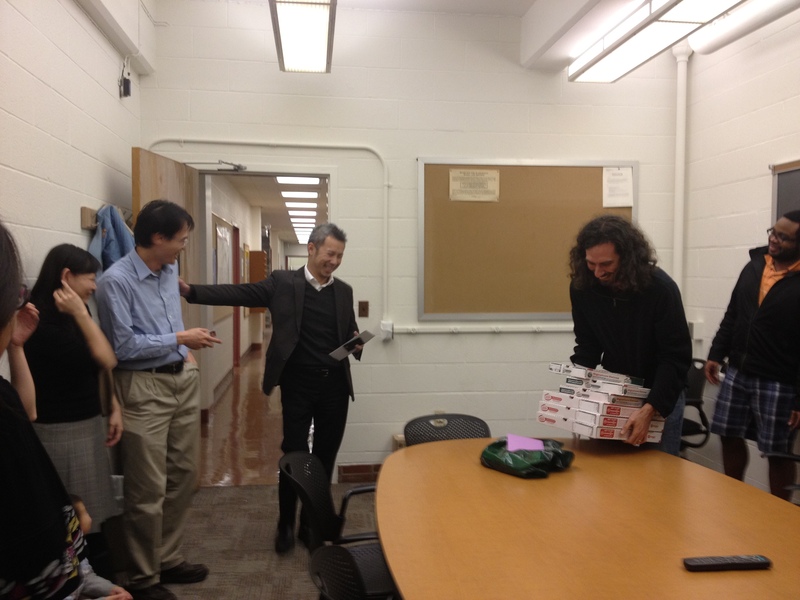 His thesis committee members include: Tsuhan Chen, Anthony Reeves, Shimon Edelman, David Forsyth. Congrats to Amir! 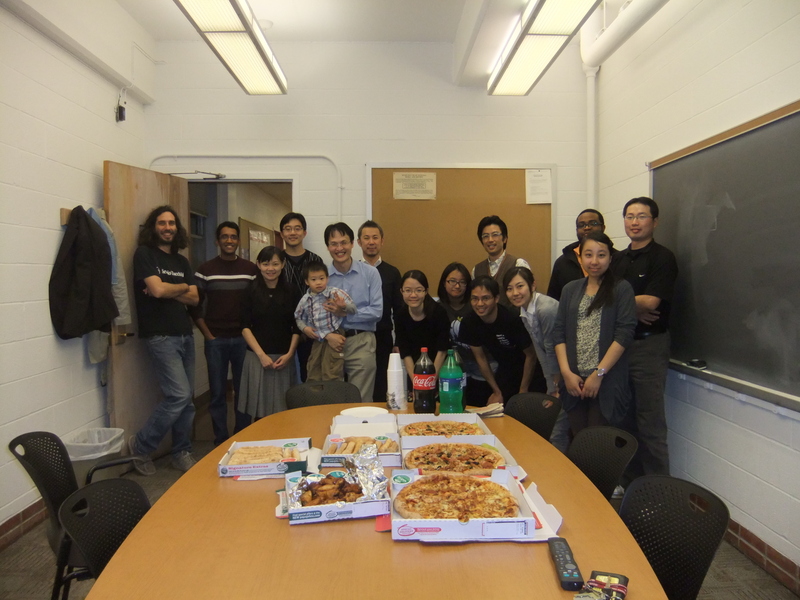 2014-6-11 AMP member Ruogu Fang successfully passes her PhD Dissertation Defense. Her thesis work is entitled "Towards Robust Medical Imaging: Sparsity-Based Perfusion Deconvolution". Her thesis committee members include: Tsuhan Chen, Ramin Zabih, Noah Snavely, Pina Sanelli. Congrats to Ruogu! 2014-6-9 We have been awarded a Clinical and Translational Science Center (CTSC) Pilot Award for our proposal "Minimal Radiation Exposure Technology For Acute Stroke Assessment". The objective of Pilot Awards program is to create opportunities for translational team research across disciplines and institutions, and between basic and clinical scientists and the community. The pilot award involves Dr. Pina Sanelli from Weill Cornell Medical College and Dr. Tsuhan Chen, Dr. Ruogu Fang from ECE Department at Cornell Ithaca campus. The funded award is based on Ruogu's thesis research with application to acute stroke assessment with minimal radiation exposure. It is a highly selective award with only 6 awardees for Pilot Award this year. Congrats to Ruogu! 2014-5-21 One paper accepted by Medical Image Computing and Computer Assisted Interventional (MICCAI) 2014 held at Boston, MA on Sep. 14-18. The paper is entitled "Tensor Total-Variation Regularized Deconvolution for Efficient Low-Dose CT Perfusion". Our paper has won the MICCAI Student Travel Award. Congrats to Ruogu! Two papers by AMP members listed below have been accepted into the IEEE International Conference on Image Processing (ICIP), 2014. The conference will be held in Paris, France from October 27th - 30th, 2014. Satoshi Ueno, Sei Naito, and Tsuhan Chen. "An Efficient Method for Human Pointing Estimation for Robot Interaction." Kuan-Chuan Peng, Kolbeinn Karlsson, Tsuhan Chen, Dong-Qing Zhang, and Heather Yu. "A Framework of Changing Image Emotion Using Emotion Prediction." Both AMP M.Eng projects given an honorable mention at Cornell's ECE day. All AMP masters of engineering students managed to receive an honorable mention for their projects presented at ECE day. The projects were judged on originallity, presentation, and demonstration. Both AMP teams were listed in the top ten. Congratulations to all the M.Eng students. Yi Zheng (MEng), Muhammad Ibrahim (MEng), Stephanie Diaz (MEng), Jessie Lin (Ugrad), Yukun Jiang (MEng), Du Sun (MEng), "Computer Vision Based Autonomous Multi-Drone System"
Charles Wang (MEng), Zhongbo Geng (MEng), Peiqi Lei (MEng), Qian Zhao (MEng), Haoyuan Wang (MEng), "Face Recognition System using the Local Binary Pattern Histogram Algorithm"
AMP alumnus Dhruv Batra receives the National Science Foundation (NSF) CAREER award! AMP alumnus Dhruv Batra, a professor at Virginia Tech, has won the NSF CAREER award, titled "Holistic Scene Understanding with Multiple Hypotheses from Vision Modules." AMP member Ruogu Fang is awarded the Hsien Wu and Daisy Yen Wu Memorial Award 2014. This is in recognition of the excellent progress in the academic program and high potential for a successful academic career. ECE's Director of Graduate Studies, Prof. Alyssa Apsel, nominated Ruogu for the award. AMP Lab wins the "Seed Grant for Collaborations Between Cornell University-Ithaca and Weill Cornell Medical College Faculty"
04/15/2014: AMP's joint application with the Radiology Department at Weill Cornell Medical College to the "Seed Grant for Collaborations Between Cornell University-Ithaca and Weill Cornell Medical College Faculty" has been chosen for funding for the year 2014-2015! It is a cross-campus, multidisciplinary collaboration involving Dr. Ajay Gupta and Dr. Pina Sanelli from the Weill Cornell Medical College, and Professor Chen and Ruogu Fang from the AMP Lab. This is a one-year grant to stimulate and support intercampus collaborations and to explore novel ideas, higher-risk or potentially transformative projects, and emerging areas. The funded research is based on Ruogu's thesis work, and titled "Learning-Based Low Radiation CT Perfusion for Acute Stroke Diagnosis." Congratulations to Ruogu! Dhruv Batra and Devi Parikh have receieved the ARO Young Investigator Program Award. ARO's Young Investigator Program (YIP) seeks to identify and support academic scientists who have received Ph.D. or equivalent degrees within the last five years and who show exceptional promise for doing creative research. The objectives of this program are to attract outstanding faculty members of Institutions of Higher Education to the Department of the Army's research program, to support their research, and to encourage their teaching and research careers. Congratulations to both of them! Dhruv Batra: "Building Reflective, Transparent, and Integrated Intelligent Systems"
Devi Parikh: "Semantic Characterizations of Failures and Beliefs of Machine Perception Systems"
Adarsh Kowdle's Paper "Putting the User in the Loop for Image-Based Modeling" has been published in the International Journal of Computer Vision. AMP paper named Best Paper at ACM Multimedia Workshop on Geotagging and Its Applications in Multimedia. AMP visitor Toshi Yamasaki's paper on travel recommendations was named the Best Paper at the 2013 GeoMM Workshop, part of the ACM Multimedia Conference, in October 2013 in Bacelona. In addition it was awarded best poster at the Image Media Processing Symposium. The paper describs geo-tagged photos from Flickr.com to learn travel patterns that travelers have in cities across the globe, and producing personalized recommendations. T. Yamasaki, A. Gallagher, and T. Chen, �Personalized Intra- and Inter-City Travel Recommendation Using Large-Scale Geo-Tagged Photos,� Proc. of 2nd ACM Multimedia Workshop on Geotagging and Its Applications in Multimedia (in conjunction with ACM Multimedia), 2013. T. Yamasaki, Andrew Gallagher, Tsuhan Chen, and K. Aizawa �Geotag-Based Intra- and Inter-City Travel Recommendation Featuring Seasonal and Temporal Popularity,� Image Media Processing Symposium, I-4-15, Yugawara, Kanagawa, Nov. 6-8, 2013. AMP paper accepted for publication in Medical Image Analysis, on the special issue of Sparse Methods for Signal Reconstruction and Medical Image Analysis. AMP member Ruogu Fang's paper "Improving Low-Dose Blood-Brain Barrier Permeability Quantification Using Sparse High-Dose Induced Prior for Patlak Model" is accepted for publication in Medical Image Analysis, on the special issue of Sparse Methods for Signal Reconstruction and Medical Image Analysis. Medical Image Analysis is the premier journal on medical and biological image analysis, with special emphasis on efforts related to the applications of computer vision, virtual reality and robotics to biomedical imaging problems. The five-year impact factor of MedIA is 4.662. Amandianeze Nwana's paper titled "A Latent Social Approach to YouTube Popularity Prediction" has been accepted to the IEEE Global Telecommunications ConferenceGlobecom 2013. The conference will be held in Atlanta, GA between December 9th-13th, 2013. 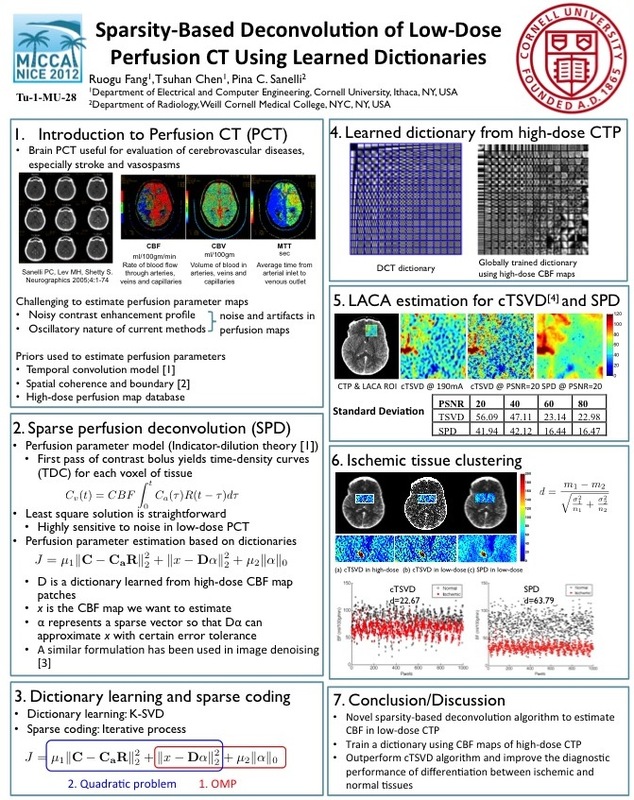 09/2013: Ruogu Fang's paper "Towards robust deconvolution of low-dose perfusion CT: Sparse perfusion deconvolution using online dictionary learning" is recognized as one of the top 25 hottest papers in Medical Image Analysis in 2013 from April to June. The ranking includes all the previously published papers in Medical Image Analysis. This is the project page of our work on robust perfusion deconvolution. 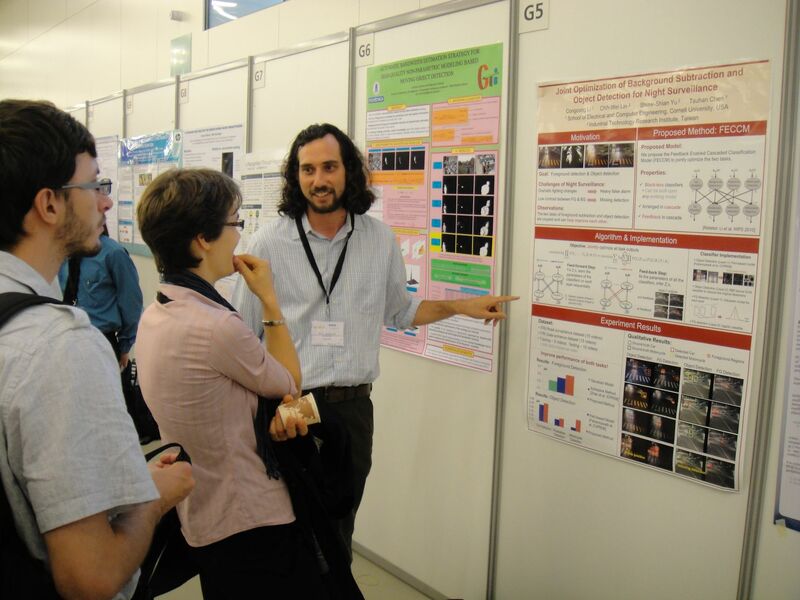 On the left is the poster presented at MICCAI 2012. Two papers by AMP members listed below have been accepted into the IEEE International Conference on Computer Vision (ICCV), 2013. The conference will be held in Sydney, Australia from December 3rd - 6th, 2013. Amir Sadovnik, Andrew Gallagher, Devi Parikh, Tsuhan Chen. "Spoken Attributes: Mixing Binary and Relative Attributes to Say the Right Thing." Kuan-Chuan Peng, Tsuhan Chen. "Incorporating Cloud Distribution in Sky Representation." Amir Sadovnik's paper "A Visual Dictionary Attack on Picture Passwords." and Henry Shu's paper "Face-Graph Matching for Classifying Groups of People." were both recognized as being among the top 10% of accepted papers to the International Conference of Image Processing 2013. Andrew Gallagher's proposal for improving the quality of images on a big display has been selected for funding by the SAMSUNG Global Research Outreach (GRO) program. Andrew is a research scientist in AMP, and the proposal is entitled: Big Screen Smart De-noising with Object Sensitive Noise Estimation. The project will run through 2014. Five papers by AMP members listed below have been accepted into the IEEE International Conference on Image Processing (ICIP), 2013. The conference will be held in Melbourne, Australia from September 15th - 18th, 2013. Ruogu Fang, Andrew Gallagher, Tsuhan Chen, Alexander loui. "KINSHIP CLASSIFICATION BY MODELING FACIAL FEATURE HEREDITY." Zhaoyin Jia, Andrew Gallagher, Tsuhan Chen. "LEARNING BOUNDARIES WITH COLOR AND DEPTH." Zhaoyin Jia, Andrew Gallagher, Tsuhan Chen. "CAMERAS AND GRAVITY: ESTIMATING PLANAR OBJECT ORIENTATION." Amir Sadovnik and Tsuhan Chen. "A VISUAL DICTIONARY ATTACK ON PICTURE PASSWORDS." Henry Shu, Andrew Gallagher, Huizhong Chen, Tsuhan Chen. "FACE-GRAPH MATCHING FOR CLASSIFYING GROUPS OF PEOPLE." We are very happy to announce that our AMP member Adarsh Kowdle has successfully graduated. He will be joining Microsoft this fall. Four papers by AMP members listed below have been accepted into the Computer Vision and Pattern Recognition (CVPR), 2013. The conference will be held in Portand, Oregon from June 23rd - 28th, 2013. Adarsh Kowdle, Andrew Gallagher and Tsuhan Chen, "Revisiting Depth Layers from Occlusions." Amir Sadovnik, Andrew Gallagher and Tsuhan Chen, "It's Not Polite To Point: Describing People With Uncertain Attributes." Huizhong Chen, Andrew Gallagher and Bernd Girod, "What's in a Name? First Names as Facial Attributes." Toshihiko Yamasak and Tsuhan Chen, "Face Recognition Challenge: Object Recognition Approaches for Human/Avatar Classification." Adarsh Kowdle, Noah Snavely and Tsuhan Chen, "Recovering Depth of a Dynamic Scene Captured Using a Dynamic Camera." ICIP 2012 was held at Orlando, Florida from 30th September to 3rd October. Of the 501 student papers accepted into the conference, 11 papers were short-listed as award candidates. This decision involved feedback from the reviewers, area chairs and the program committee of the conference. The 11 student authors were invited to present their work to a panel of judges that comprised of 9 prominent researchers in the community, at a special session. The committee selected 3 papers as the Best Student Paper. 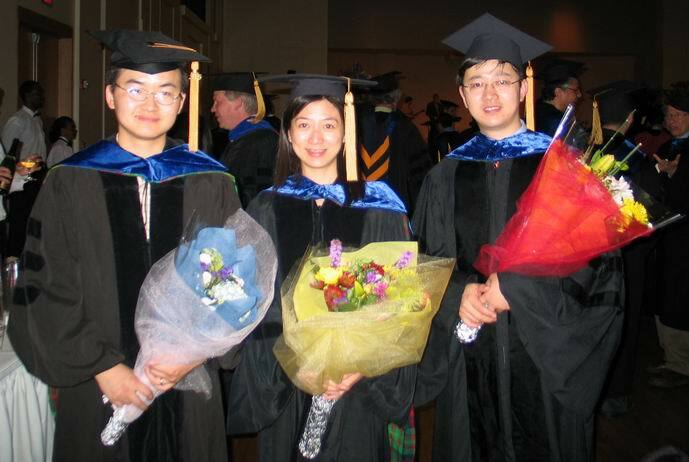 We are very happy to announce that two of our AMP members Congcong Li and Yimeng Zhang have successfully graduated. Both Congcong and Yimeng will join Google starting this fall. Prof. Chen and the AMP group would like to congratulate them and wish them good luck in all their future endeavors. Three papers by AMP members listed below have been accepted into the European Conference on Computer Vision (ECCV), 2012. The conference will be held in Firenze, Italy from October 7th - 13th, 2012. Adarsh Kowdle and Tsuhan Chen, "Learning to Segment a Video to Clips Based on Scene and Camera Motion." Yimeng Zhang, Xiaoming Liu, Ming-Ching Chang, Weina Ge and Tsuhan Chen, "Spatio-Temporal Phrases for Activity Recognition." I am a Visiting Research Scientist at Cornell University's School of Electrical and Computer Engineering, beginning in June 2012. I earned the Ph.D. degree in electrical and computer engineering from Carnegie Mellon University in 2009, advised by Prof. Tsuhan Chen. I received his M.S. degree from Rochester Institute of Technology in 2000, and the B. S. degree from Geneva College in 1996, both in electrical engineering. I worked for the Eastman Kodak Company for nearly 16 years (from 1996 to 2012), initially developing image enhancement algorithms for digital photofinishing. These efforts resulted in more than 90 issued U.S. Patents and Kodak's prestigious Eastman Innovation Award in 2005. More recently, my interests are in the arena of improving computer vision by developing models that incorporate context, human interactions, and unique image cues. Further, I enjoy working in the areas of graphical models and image forensics. Outside of computer vision, I enjoy spending time outside, woodworking, and sports and games. 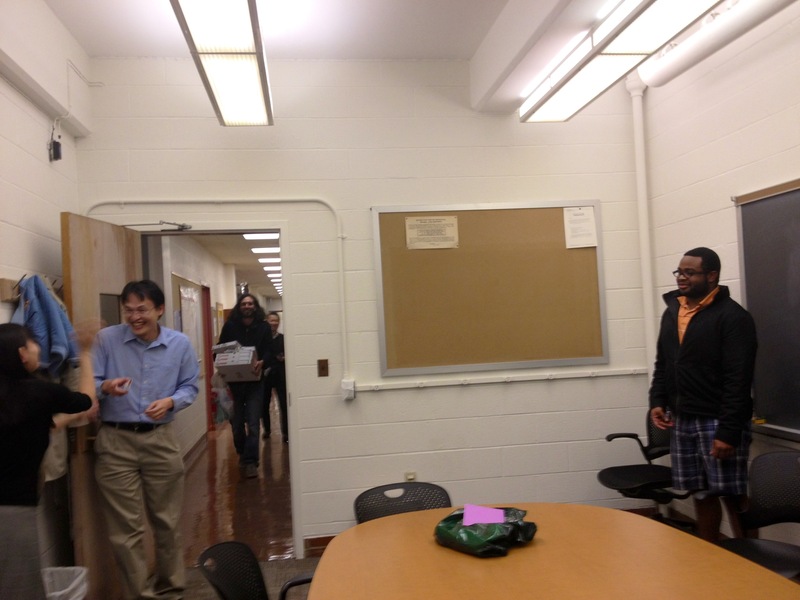 Two projects by MEng students working with the AMP lab won prizes at ECE Day 2012. Three papers by AMP members listed below have been accepted into the IEEE International Conference on Image Processing (ICIP), 2012. The conference will be held in Orlando, Florida from September 30th - October 3rd, 2012. 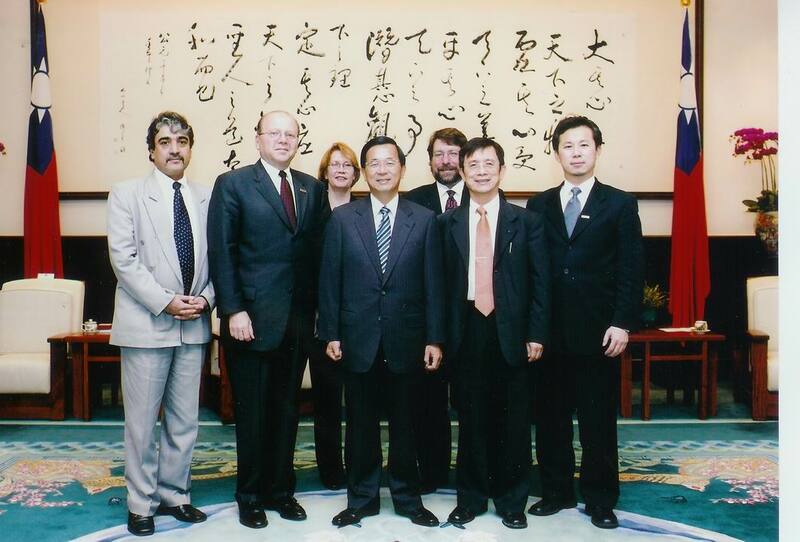 Henry Shu, Y.-F. Hsu, S.-S. Yu, and Tsuhan Chen. "Wide Area Video Surveillance with Spatial-Temporal Constraints." Adarsh Kowdle, Noah Snavely and Tsuhan Chen, "Recovering Depth of a Dynamic Scene using Real World Motion Prior." Amir Sadovnik and Tsuhan Chen. "Hierarchical Object Groups for Scene Classification." AMP member Congcong Li, with Prof. Tsuhan Chen, have contributed the chapter "Visual Aesthetic Quality Assessment of Digital Images" for the book entitled "Perceptual Digital Imaging: Methods and Applications", to be published by CRC Press / Taylor & Francis. The book will be published in summer of 2012. Four AMP papers listed below have been accepted into the IEEE Conference on Computer Vision and Pattern Recognition (CVPR), 2012. The conference will be held in Providence, Rhode Island from June 16th - 21st, 2012. Congcong Li, Devi Parikh and Tsuhan Chen, "Automatic Discovery of Groups of Objects for Scene Understanding." Zhaoyin Jia, Andrew Gallagher, Yao-Jen Chang and Tsuhan Chen, "A Learning Based Framework for Depth Ordering." Yimeng Zhang and Tsuhan Chen, "Efficient inference for Fully-Connected CRFs with Stationary." Amir Sadovnik, Yi-I Chiu, Noah Snavely, Shimon Edelman and Tsuhan Chen. "Image Description with a Goal: Building Efficient Discriminating Expressions for Images." AMP member Yimeng Zhang won the Best Student Paper Award at the Workshop for Applications in Computer Vision (WACV) 2012 held in Breckenridge, Colorado. Her paper titled "Group Context Learning for Event Recognition" was joint work with Weina Ga, Ming-Ching Chang, Xiaoming Liu, from GE Global Research. A paper from AMP listed below has been accepted into the Conference on Neural Information Processing Systems (NIPS), 2011. The conference will be held in Granada, Spain from December 12th - 17th. Congcong Li, Ashutosh Saxena, Tsuhan Chen. "$\theta$-MRF: Capturing Spatial and Semantic Structure in the Parameters for Scene Understanding." AMP member Wei Yu, joined the FTAP (financial technology associate program) in Citadel Investment Group in Chicago. The program consists of two months of financial classes and three 4-month rotations in different groups. AMP group's research scientist, Kevin Chang is leaving Cornell and heading to Siemens Research on November 21st to start a new career. Kevin joined that group fours years ago when the group was based at Carnegie Mellon. We are very excited for Kevin and wish him good luck for all his future endeavours. Below are pictures from a surprize farewell party the group put together. AMP alum Devi Parikh won the Marr prize at ICCV 2011 for her work on relative attibutes. D. Parikh and K. Grauman. "Relative attributes", International Conference on Computer Vision (ICCV), 2011. 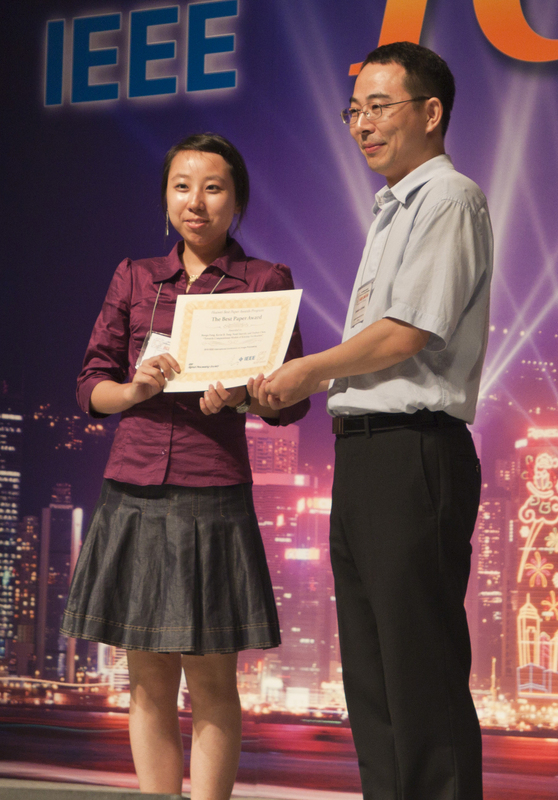 AMP member Yimeng Zhang received GE's 2011 Early Identification Award for her contribution of the summer intern. The award recognizes the top 3% of students across all GE functional areas and businesses. Yimeng was an intern in the Visualization and Computer Vision lab in GE during the summer. She worked on the project of event recognition from surveillance videos, and mentored by Xiaoming Liu, Ming-Ching Chang, and Weina Ge. The project includes both novel algorithm design and real time system implementation. AMP member Adarsh Kowdle in collaboration with alumni Dhruv Batra and Devi Parikh, and Jiebo Luo have published a book "Interactive Co-segmentation of Objects in Image Collections". The publishers of the book at Springer, and the book is in a series called SpringerBriefs in Computer Science. The book is available for pre-order online. Prof. Tsuhan Chen, along with AMP lab member Amir Sadovnik and visiting scholar Toshihiko Yamasakhi, attended the IEEE International Conference on Image Processing held in Brussels, Belgium from September 11th-14th. The lab had 6 accepted papers in the conference which were all well received. Two AMP papers listed below have been accepted at the International Conference on Computer Vision (ICCV), 2011. The conference will be held in Barcelona, Spain from November 6th - 13th. AMP alum Wende Zhang invited to give keynote speech at VTI 2011. AMP alum Wende Zhang was invited to give a keynote speech at The International Forum on Advanced Vehicle Technologies and Integration (VTI) 2011 on July 16-18 in Changchun, China. Wende will also be giving invited talks at Shanghai Jiaotong University and GM R&D China Science Lab. Six AMP papers listed below have been accepted at the IEEE International Conference on Image Processing (ICIP), 2011. Prof. Tsuhan Chen, the leader of the AMP Lab was invited to give a plenary talk at the Wireless and Optical Communication Conference (WOCC '11) held in New Jersey on April 15-16. Recent paper by AMP member Adarsh Kowdle in collaboration with alumni Dhruv Batra and Devi Parikh is among the top downloaded articles from IJCV. D. Batra, A. Kowdle, D. Parikh, J. Luo and T. Chen. "Interactively Co-segmentating Topically Related Images with Intelligent Scribble Guidance", International Journal of Computer Vision, 2011. Two AMP papers listed below have been accepted as orals at Computer Vision and Pattern Recognition (CVPR), 2011. Y. Zhang, Z. Jia and T. Chen. "Image Retrieval with Geometry-Preserving Visual Phrases", IEEE Conference on Computer Vision and Pattern Recognition (CVPR), 2011. A. Kowdle, Y. Chang, A. Gallagher and T. Chen. "Active Learning for Piecewise Planar 3D Reconstruction", IEEE Conference on Computer Vision and Pattern Recognition (CVPR), 2011. The year 2010 came to an end on a very special note for the AMP lab. 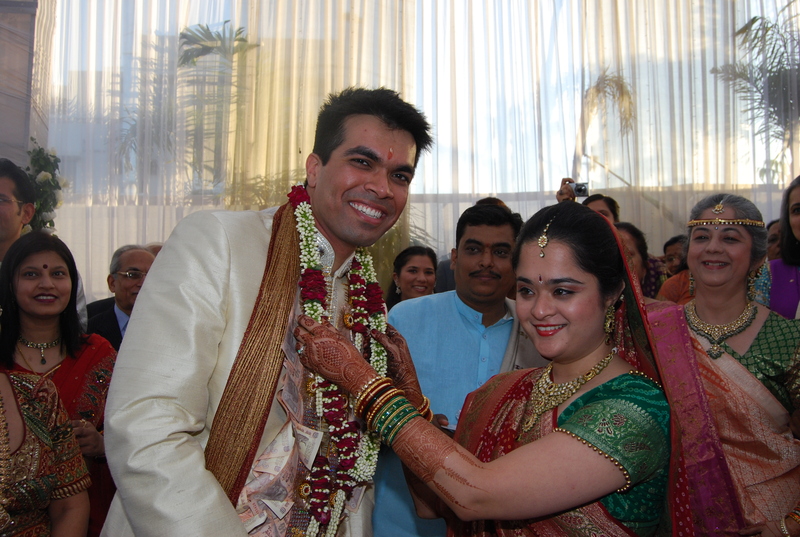 AMP alumni Dhruv Batra got married to alumni Devi Parikh in a beautiful wedding in Ahmedabad, India. 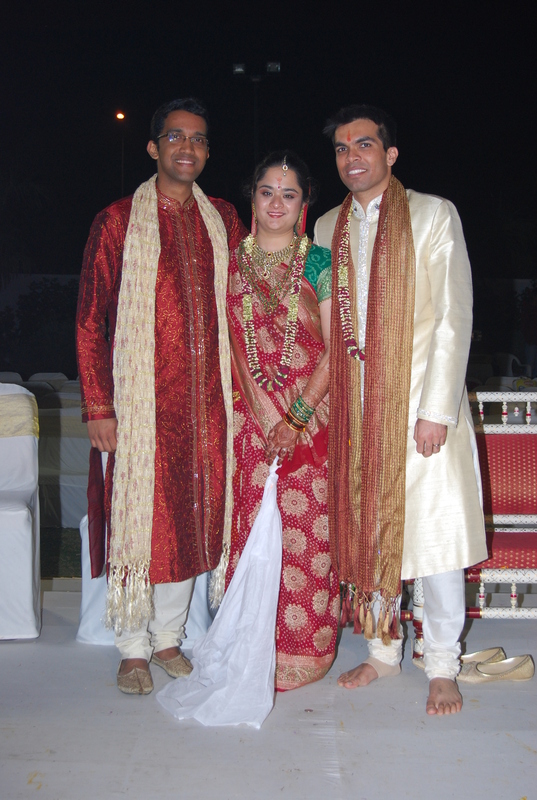 The wedding was attended by one of the group members Adarsh Kowdle. Devi and Dhruv graduated from the group in 2009 and 2010 respectively and are both currently research faculty at TTI, Chicago. 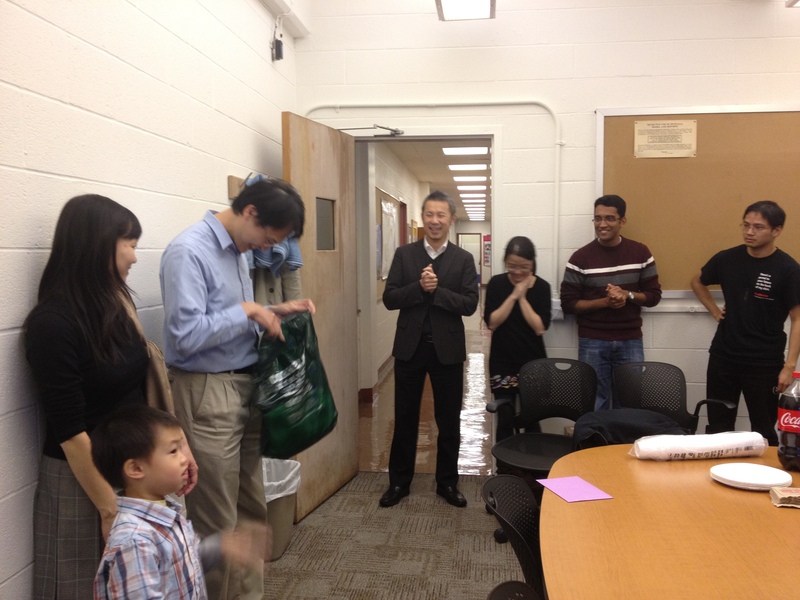 Prof. Chen and all the group members congratulate Devi and Dhruv, and wish them a wonderful future together. Ruogu Fang, a PhD student, and a member of the AMP lab, receives the Best Paper Award at 2010 IEEE International Conference on Image Processing (ICIP) for her paper entitled "Towards Computational Models of Kinship Verification", co-authored with advisor Prof. Tsuhan Chen, along with Kevin D. Tang and Prof. Noah Snavely. The award was presented in Hong Kong during the conference held on September 26th to 29th, 2010. ICIP is the world's largest and most comprehensive technical conference focused on image processing and its applications. The Best Paper Award is selected from the 1190 papers accepted worldwide this year. 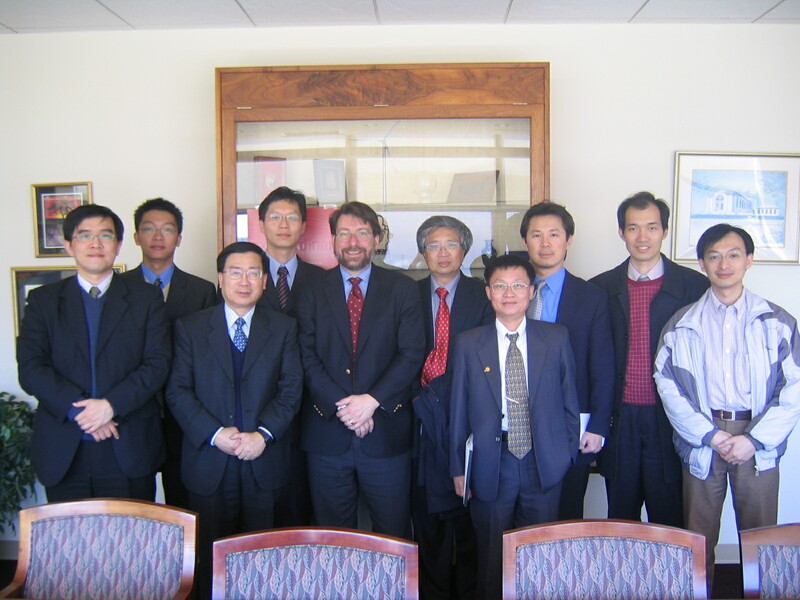 AMP alumni Wende Zhang elected as the President Elect/Program Chair for Sigma Xi at GM R&D Chapter for 2010-2011. AMP alumni Wende Zhang currently a senior researcher at GM R&D has been elected as the President Elect/Program Chair for Sigma Xi at GM R&D Chapter for 2010-2011. The international honor society of science and engineering, Sigma Xi has nearly 60,000 members who were elected to membership based on their research potential or achievements. More than 500 Sigma Xi chapters in North America and around the world provide a supportive environment for interdisciplinary research at colleges and universities, industry research centers and government laboratories. More than 200 members have won the Nobel Prize. AMP Alumni Andrew Gallagher, currently a Senior Principal Scientist at Eastman Kodak Company, has been elevated to the status of Senior Member of the Institute of Electrical and Electronic Engineers (IEEE). Senior Member status requires at least five years of "significant performance" in professional practice, a demonstration of professional maturity, and at least ten years of practice. Senior Member status is attained by fewer than ten percent of the IEEE's members. Andrew graduated from AMP with a Ph.D. from Carnegie Mellon University in 2009. The commencement ceremony at Carnegie Mellon took place on the 16th of May, 2010. We are very happy to announce that two of our AMP members Dhruv Batra and Amy Meihsuan Lu were conferred their degrees at the ceremony. Prof. Chen and the AMP group would like to congratulate them and wish them good luck in all their future endeavors. AMP members Prof. Chen, Kevin Chang, who is a research scientist, and Adarsh Kowdle and Henry Shu, who are second-year PhD students, give a series of talks, technical presentations, and demos at Chunghwa Telecom, Taiwan (the Bell Lab of Taiwan) on Mar 19, 22, and 23, 2010. These talks focus on the technology, feasibility, and realization of adapting some of the AMP projects (multi-view geometry, GIS/landmark recognition, and video categorization) into commerce-ready applications targeted primarily for corporations in the multimedia sector in East Asia. Ruogu Fang, first year PhD student and member of Advanced Multimedia Laboratory, was awarded the best PhD Poster Presentation Award at Cornell Research Engineering Conference 2010, for her research project titled "Kin Recognition and Ancestry Tracing for Facial Images". The project seeks to find kin recognition cues from human faces through computer vision and machine learning techniques, and achieve recognition accuracy comparable with human performance. AMP member Dhruv Batra gives a talk at Microsoft Research, Redmond. AMP member Dhruv Batra gave a talk at MSR, Redmond on 14th December, 2009. The talk was titled, "Beyond Trees: MRF inference via outerplanar decomposition"
AMP member Kevin Tang, an undergraduate senior, has received an Engineering Learning Initiatives research award for the Spring 2010 semester. The project, titled "Incorporating transfer learning into part-based models", seeks to find ways to combine weakly labeled images with fully labeled images to help improve part-based recognition performance. The research is funded by Cisco. AMP Alumni Trista Chen, currently working as Senior Researcher at Gracenote, Sony Corporation of America, graduated from ECE CMU with her Ph.D. in 2003. She has since contributed towards cutting edge research in a number of companies like Intel, NVIDIA and more recently in Gracenote. She visited Cornell on the 21st of October to talk to the students and Prof. Chen, about her experiences in research and her professional career. AMP member David Liu's paper titled "DISCOV: A Framework for Discovering Objects in Video" has been ranked 4th among the top documents in March 2008 to be accessed in the IEEE Transactions on Multimedia. The rankings can be found here. D. Parikh, L. Zitnick and T. Chen, "From Appearance to Context-Based Recognition: Dense Labeling in Small Images," IEEE Conference on Computer Vision and Pattern Recognition (CVPR) 2008. A.B. Ashraf, S. Lucey and T. Chen. "Learning Patch Correspondences for Improved Viewpoint Invariant Face Recognition," IEEE Conference on Computer Vision and Pattern Recognition (CVPR), 2008. A. Gallagher, T. Chen, “Estimating Age, Gender and Identity using First Name Priors,” IEEE Conference on Computer Vision and Pattern Recognition 2008. A. Gallagher, T. Chen, “Multi-Image Graph Cut Clothing Segmentation for Recognizing People ,” IEEE Conference on Computer Vision and Pattern Recognition 2008. List of all AMP publications can be found here. 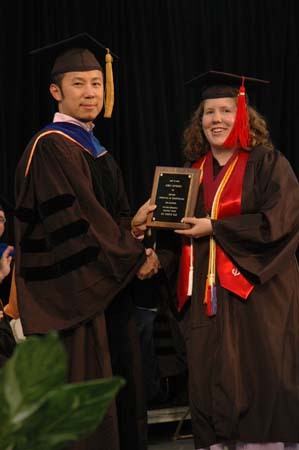 AMP Alumni Claire Fang graduated from ECE CMU with her Ph.D. in 2005. She worked at McKinsey, and is now joining Microsoft as a business strategy manager in the Online Service Group. Past AMP member Faistinus Gozali received the E. M. Williams award at the ECE Diploma ceremony 2007. The award is given to an ECE senior in recognition of superior scholastic achievement and community service. Prof. Tsuhan Chen received the Eta Kappa Nu (HKN) Award for Outstanding Faculty Teaching that is presented to an ECE faculty member in recognition of teaching excellence. 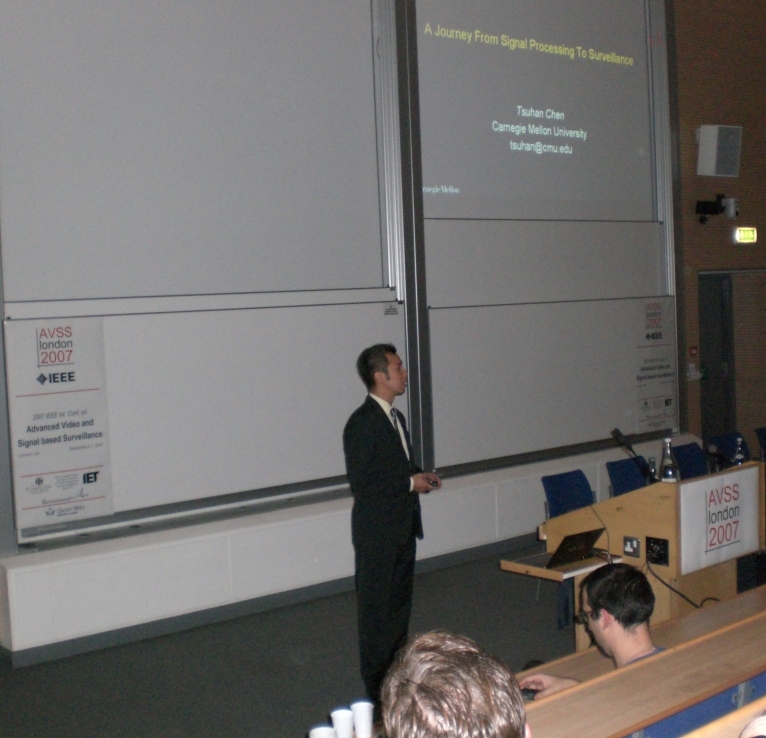 Professor Tsuhan Chen gave a keynote talk at Advanced Video and Signal Based Surveillance (AVSS), 2007 in London, UK, on "A Journey from Signal Processing to Surveillance". Cha Zhang, now at Microsoft Research, Redmond, was awarded the best paper award at IEEE International Conference on Multimedia and Expo (ICME), 2007 for his paper titled "Learning-Based Perceptual Image Quality Improvement for Video Conferencing"
Devi Parikh won the best paper award at the IEEE Conference on Computer Vision and Pattern Recognition (CVPR), Beyond Patches workshop, 2007 for her paper titled “Unsupervised Learning of Hierarchical Semantics of Objects (hSOs)". Andrew Gallagher won the best paper award at the IEEE Conference on Computer Vision and Pattern Recognition (CVPR), Workshop on Semantic Learning Applications in Multimedia (SLAM), 2007 for his paper titled “Using Group Prior to Identify People in Consumer Images". Wende Zhang was awarded his Ph.D. degree at the diploma ceremony 2007. His thesis is titled "A Probabilistic Framework for Geometry and Motion Reconstruction Using Prior". He has joined General Motors. 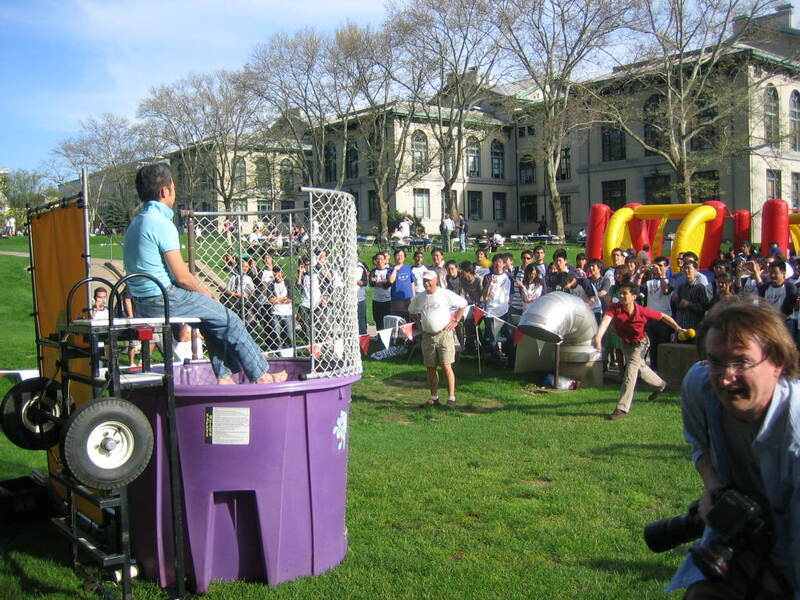 Professor Tsuhan Chen volunteers to be on the dunk tank! 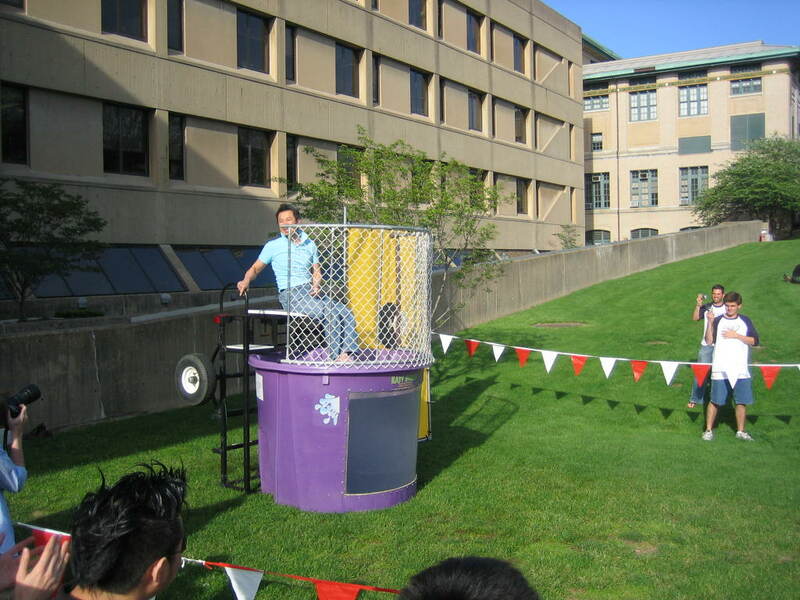 Professor Tsuhan Chen volunteers to be on the dunk tank for the ECE day at CMU! 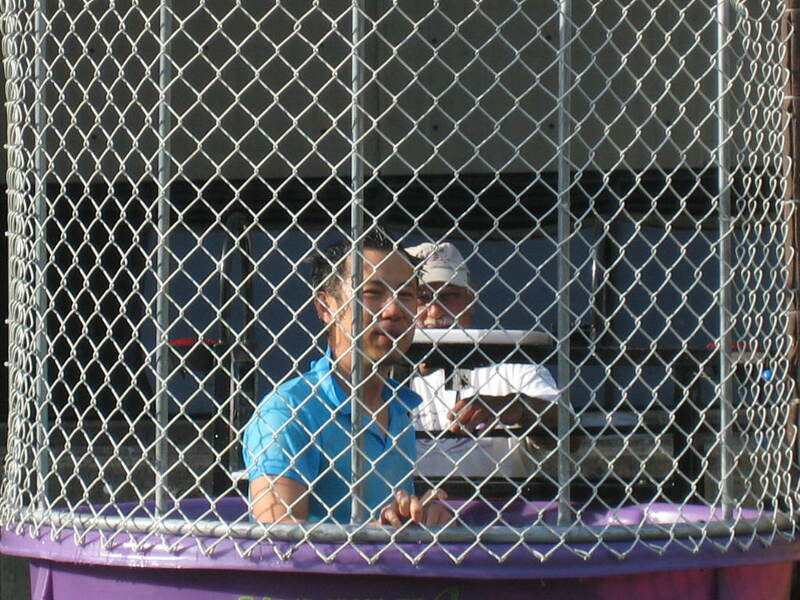 Many of the AMP members dunked Prof. Chen and helped raise several hundred dollars for charity. The Board of Directors has named 268 IEEE Senior Members to Fellow Grade effective 1 January 2007. 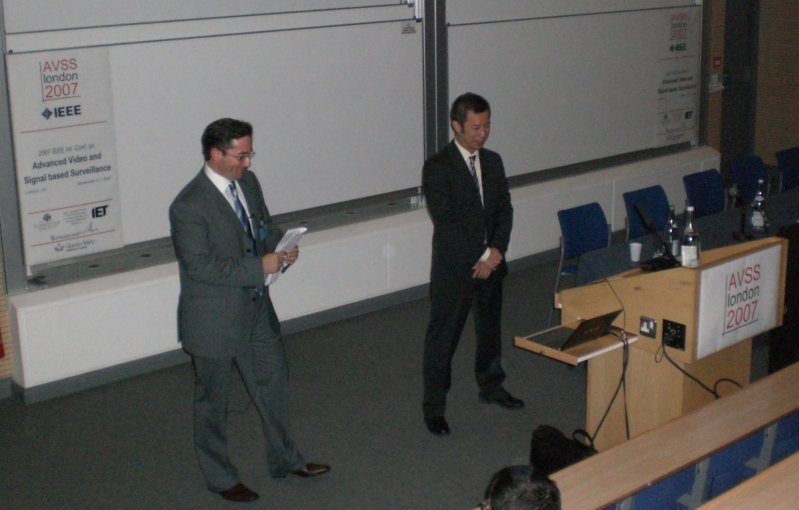 Professor Tsuhan Chen was one of them, for hist contributions to multidisciplinary multimedia signal processing. More information can be found here and here. Former AMP member Cha Zhang's book "Light Field Sampling" - now in print! Cha Zhang, a former AMP member who graduated with his doctorate degree in 2005, publishes a book "Light Field Sampling", co-authored by Professor Tsuhan Chen. The publishers of the book are Morgan and Claypool publishers. The book is now in-print yet. For more information can be found here or here or here. 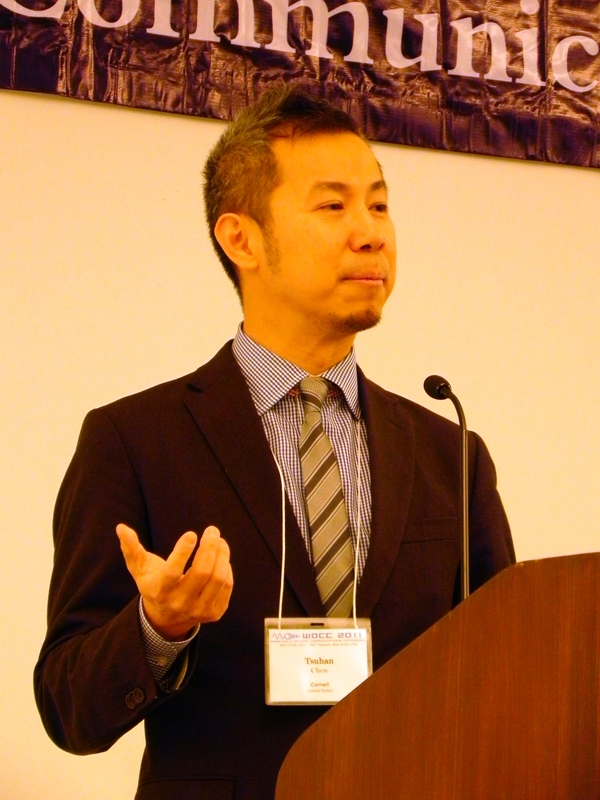 Professor Tsuhan Chen gives a keynote speech titled "Multimedia Analysis: Marriage of Signal Processing and Machine Learning" at the Pacific-Rim Conference on Multimedia 2006. The conference was held at Zhejiang University in Hangzhou, China during November 2 - November 4 2006. Further details can be found here. First PhD graduate of the AMP lab, Deepak Turaga, was invited to serve as the Associate Editor of the IEEE Transactions on Circuits and Systems for Video Technology. His term of service will be for two years. Former AMP member Cha Zhang publishes a book "Light Field Sampling"
Cha Zhang, a former AMP member who graduated with his doctorate degree in 2005, publishes a book "Light Field Sampling", co-authored by Professor Tsuhan Chen. The publishers of the book are Morgan and Claypool publishers. The book is not in-print yet. Professor Tsuhan Chen will co-direct iCAST (International Collaboration for Advancing Security Technology) - Carnegie Mellon collaboration. CMU has signed a $3 million agreement with the Taiwanese government, establishing a new research program and education outreach initiative. The rest of the article can be found here. Andrew Gallagher and Prof. Chen feature in an article in Discovery News - "Red-Eye Tech Gauges Age" on gauging a person's age through digital images. The article can be found here. David Liu receives the Outstanding Teaching Assistant Award presented to an ECE teaching assistant for extraordinary performance in the department's teaching program. The ECE press release can be found here. Frank J. Marshall Scholar Award: To an ECE senior in recognition of outstanding scholastic and research achievement. Recipient: AMP undergraduate student Thammanit Pipatsrisawat. International Engineering Consortium – William L. Everitt Student Award of Excellence: Honors outstanding senior students majoring in ECE or Computer Science. AMP undergraduate student Thammanit Pipatsrisawat won 1st prize in the Bose competition and got an honorable mention in the Sigma Xi competition. (05/04/2005). Starting from May 2005, Wen-Hao Wang and Fu-Jen Hsiao from ITRI visit AMP for 6 months. "A survey on image-based rendering--representation, sampling and compression" by Cha Zhang and Tsuhan Chen and "No reference PSNR estimation for compressed pictures" by Deepak S. Turaga et al. are ranked the 7th and 14th of the most requested articles from January - August 2004 in Signal Processing: Image Communication. (10/10/2004). Taiwan President Chen Greets Carnegie Mellon President Jared Cohon and Praised the "ITRI Lab@CMU"
Taiwan President Chen Shui-bian greeted Carnegie Mellon President Jared Cohon and other delegates, including Provost Mark Kamlet, ECE Department Head Pradeep Khosla, and Professor Tsuhan Chen, Director of the "ITRI Lab@CMU," at the Presidential Office in Taipei. Chen said, CMU is an excellent university not only in USA, but also in the world. It is the leading university in the field of computer engineering. Chen believes that this visit will increase exchanges and cooperation opportunities with Taiwan's academic and industrial institutions. Chen said he was pleased to know that the CMU has established collaboration with National Chiao Tung University (NCTU), and that the Industrial Technology Research Institute (ITRI) has set up a research center on the CMU campus, conducting research on system on chip, multimedia, and security technologies. These research areas are very important for Taiwan. Starting from October 2003, Dr. Kubota Akira from the University of Tokyo visits AMP for one year. Oct 3-- AMP graduate student Michael Kaye gave a talk, “Stop Sign Detection” and Wende Zhang gave a talk, “Automatic Key Generation for Encryption Based on Biometrics” on GMCRL meeting. August 25-27- AMP graduate student Claire Fang Fang won best paper award at TECHCON 2003 at the Hyatt Regency in Dallas, Texas. Fang's system design paper is called "Efficient Static Analysis of Fixed-Point Error in DSP Applications via Affine Arithmetic Modeling." Cha Zhang got his PhD in 2004 and is currently working as a researcher are Microsoft. We are extremely happy to learn that he has just been promoted to a Senior Member of IEEE. Congratulations Cha! Researchers are taking the lowly hand gesture out of the realm of digital expletives and making it a full-fledged control interface. Soon, drivers will be able to command vehicle functions with the wave of a hand. (Automotive Design & Production, July, 2003).